Do you have an oven that needs cleaning? If so, talk to us! Do you have an oven that you want thorough cleaned? You might decide that it’s time to get it cleaned professionally. It might be that there’s a particular stain, mark, or area of buildup that you haven’t been able to shift by yourself. If that’s the case, it can be a good idea to ask a professional cleaner to have a look at. Or, on the other hand, you might want the whole thing cleaned carefully and thoroughly, and you would prefer to leave it to a professional cleaner. That way, you can be absolutely sure that the job gets done right. Again, that you don’t have the time or energy do the job properly by yourself, and so you’d prefer to hire a professional to get the job done to a very high standard. 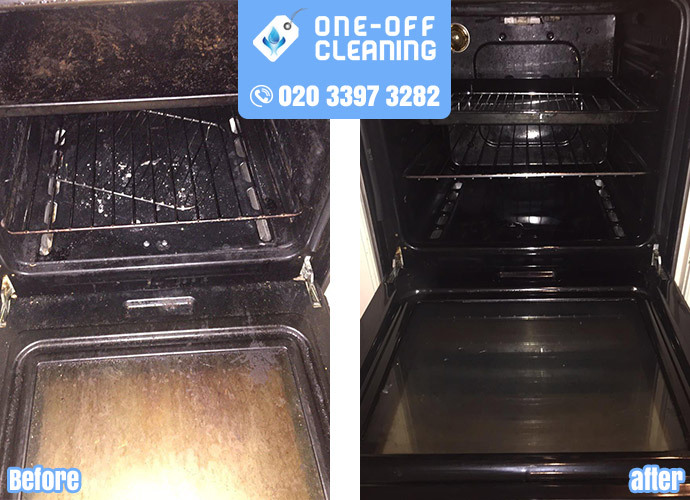 No matter what, you’ll find One-Off Cleaning can provide you with what you need to get your oven looking as good as new. We offer a complete range of cleaning services, no matter what your cleaning problem is. To learn more about what we can offer, just get in touch with us on 020 3397 3282 and ask one of our friendly representatives for your free quote. Our complete and comprehensive range of services cover absolutely everything you might need when you’re planning a cleaning operation. That means that, whether it’s your home or your office that you’re looking at having cleaned, and whether you’re considering a general clean or, by contrast, just want to have a particular item or stain taken care of, our great team of cleaners will be able to provide you with just what you need. Of course, there are lots of people who worry about the level of disruption that bringing in a professional cleaner company can cause for their home or business. This can be true no matter whether you’re looking at getting something cleaned in your home or in your office. Will you have to remove or shift all the furniture in your office to get the carpets in in cleaned? If you’re getting your oven cleaned, how long will it put your kitchen out of commission? These sorts of concerns can really put people off hiring cleaners. When you come to the right cleaning firm, though, you’ll find that a professional cleaning operation doesn’t have to cause this sort of fuss or hassle. With our skilled and reliable cleaners, you’ll have absolutely no need to worry about your cleaning job taking up more time or space than it needs to. If you decide to hire us, you can be quite sure you’ll have the best cleaning staff around. With our great, can-do attitude, and with many years of experience in the business, you’ll find that cleaning doesn’t have to be a stressful or disruptive business. In fact, you’ll find that, with the right team of cleaners, cleaning can be a smooth and easy process, whether you’re looking at a one-off job like getting your rugs or carpets cleaned, or looking at a complete clean of your entire house or business. If you’d like to have your oven cleaned professionally, then, or if you want some other cleaning task taken care of, no matter how big or how small, you should give One-Off Cleaning a ring today. Just give us a call today on 020 3397 3282 and ask one of our friendly staff members for your free quote. With our great team of cleaners, our positive attitude, and our comprehensive range of high-quality services, you’ll find you’ve got everything you need.